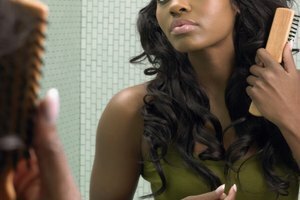 Detangling hair often and carefully is one key to keeping hair extensions from falling out. You have brand-new hair extensions, and you're feeling confident and satisfied with your long locks. Now you want to make sure your extensions maintain their appeal so that you can keep them for as long as possible. Extensions are not difficult to maintain, but they must be cared for to maintain a natural look and keep them in place. 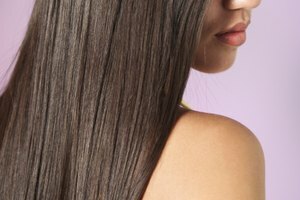 Learn the basic rules about how to treat and care for your hair extensions to keep them from falling out. Wash hair with a gentle shampoo and conditioner (buy shampoo and conditioner specifically for hair with extensions). Leave conditioner in while you shower and wash, and rinse it out last. Towel dry hair gently, careful not to create any tangles, and use a leave-in conditioner to keep hair extensions smooth and shiny. Unless your hair produces oil very quickly, don't wash your hair daily but every other day to prevent unnecessary pulling on your hair. Brush your hair often and carefully using a "looper brush," which is a brush made especially for hair extensions, or a wide-tooth comb. Tangles are not your friend, so brushing your hair from the bottom slowly and working your way up saves you a lot of stress when it comes to matted, tangled extensions. Eliminate any knots before washing your hair, and never let tangles or knots build. Sleep with your hair in a ponytail or a braid to avoid difficult bed-head knots when you wake up. Avoid heat-styling tools. If you have synthetic extensions, avoid them at all costs as they can melt hair. This includes flat irons, curling irons and other heated styling tools. Even blow dryers can damage hair, so air dry wet, synthetic extensions. Keep in mind that synthetic hair extensions are meant for women who want a permanent style and do not have to worry about further styling. For better styling options, you can opt for heat-resistant synthetic extensions, which can be styled with hot tools. These extensions are best styled with digital heat appliances that allow for exact temperature settings as most heat-resistant extensions have a temperature range within which you can work. 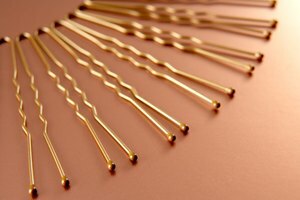 Heated tools can be used on 100-percent human hair extensions. Keep in mind that overuse will shorten the life of human hair extensions. 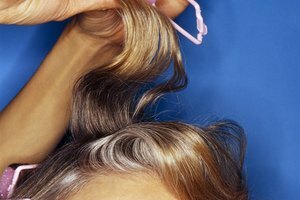 Avoid extensions that are heavier than your own hair. If your extensions are too heavy, they can break off and damage your hair. Wear a swim cap to protect your hair from chemicals while swimming, making sure that no piece of hair is unprotected. Wash your hair immediately following swimming to remove any chemical that could have permeated the cap. The key to long-lasting extensions is choosing extensions that are best for your personal hair type. Talk to your stylist about the right type for you. While human hair extensions are easier to care for, they are also more expensive than synthetic extensions. Synthetic extensions come in different qualities that can make them look more realistic. Your stylist will have recommendations based on your hair type. Ebay: Can I Style Hair Extensions With Hot Tools? Gianino, Laura. "How to Keep Extensions From Falling Out." Synonym, https://classroom.synonym.com/keep-extensions-falling-out-10688.html. Accessed 19 April 2019.